Almost one year since we broke ground on a new ULS clinic in Bande du Nord, Haiti, the primary care facility is now open for business and seeing patients. This vital community resource was made possible only by the generous support of Konbit Sante patrons like you who helped organize and staff fundraisers, volunteered their professional services, and donated more than $215,000 for landscaping, construction, and program support. Bande du Nord (Fort Bourgeois) is an economically poor communal section of Cap-Haitien with more than 25,000 people, and ULS has been the only fixed center for health care in the community since 2010. Under the direction of Dr. Maudelin Mesadieu, it is an essential component to providing emergency, preventative and primary care; medicines; immunizations; simple lab tests; ready-to-use therapeutic foods for the treatment and prevention of childhood malnutrition; and family planning and other services. The clinic serves an estimated 400 clients per month, and provides services whether patients can pay or not—often, the staff works on a volunteer basis when funds are low. Recognizing the importance of this clinic in the community and impressed with ULS’ commitment to building a sustainable, long-term health system, Konbit Sante became a partner in 2012. The old clinic was not suitable for its needs, so we offered to help ULS build a new clinic if it could secure ownership of land. True to its name (United de Lutte pour la Sante, or “Fighting Unit for Health”), it did just that by meeting with the community and arranging a series of negotiations, contributions, and trade-offs. In early 2013, Konbit Sante organized a team of engineers and architects from the U.S. who volunteered to survey the land and develop a site plan appropriate for the new location. It took a while to raise the necessary funds, but when we did in 2018, construction soon began and involved not just the physical structure of the clinic but landscaping mitigation to protect both the new building and the adjoining neighborhood from excessive rain runoff coming off the road above. Local engineers and labor were employed for the work, and local materials were used in the construction. There have been many adjustments and unforeseen circumstances along the way, but work on the clinic was essentially completed in March, and the clinic opened the first week of April. 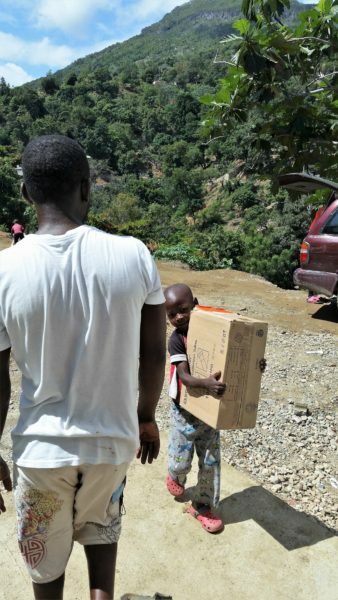 In the true spirit of a konbit, the community came together on moving day to help move equipment and supplies from the old clinic to the new one. As with everything we do, this project would not have happened without the combined dedication and efforts of the many people who walk with us in this konbit as we continue our mission of building a sustainable health system in Northern Haiti. Thanks to you, ULS can now continue to serve the healthcare needs of Bande du Nord. not-for-profit corporation organized in the state of Maine.